LEE COUNTY, Fla -- One of the perks of being in Florida is the weather and the wildlife, especially when you see an alligator. But when you see one in your house not so much. A gator needed to be removed from a lanai in Fort Myers home early Friday morning. 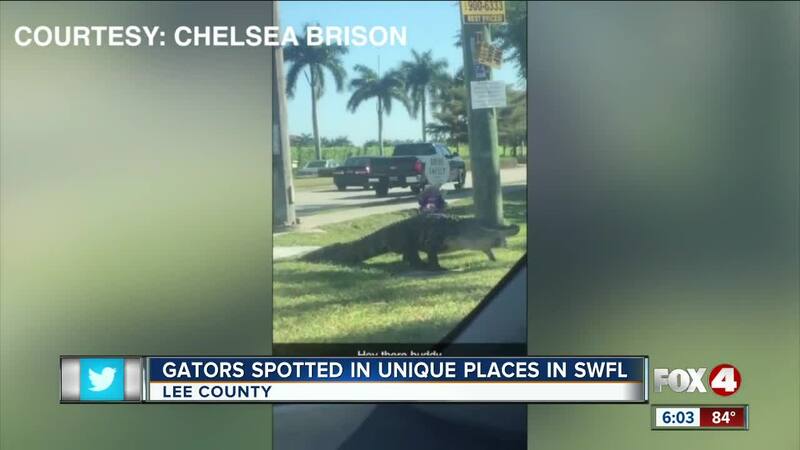 The surprise gators didn't stop there another alligator was seen casually strolling on McGregor Blvd and Pine Island Road Friday afternoon. When gators are walking around town, and popping up in strange places, you may assume it's mating season. It turns out Florida Fish and Wildlife says that's a common misconception, they say an alligators mating season isn’t until May. FWC says when it starts to warm up, an alligator's metabolism speeds up, and they get a little hungry. "They have to find some food, so that’s when we’ll find them on sidewalks and peoples pools they’re really just out there browsing around," said Brian Norris, with the Florida Fish and Wildlife. When it comes to alligators, Norris says they’re wary of humans, but Norris says keep your pets and children at a safe distance. "If you are near water, just mindful of that there could be some sunning themselves on the bank, if you have pets, be mindful especially near water," Norris said.